- The club's motto; "E Pluribus Unum" (Out of many, one) is written on the back of the collar. A big, clunky Adidas medium shirt. It is the collars on these style of shirts. Throw one on and it automatically makes the shirt feel one size larger than it is. The colour is a wonderful deep red which stands out perfectly against the white trims. The sponsor on the front might be a little too high but other than that this shirt is a very good example of a simple but effective club football shirt. Benfica have always worn red shirts. During the Estado Novo, the Censorship Services prohibited the fans from referring to the team as Vermelhos (Reds) so it was not confused with communism, instead being referred as Encarnados (Flesh-coloured), which is still used, even after the Carnation Revolution. 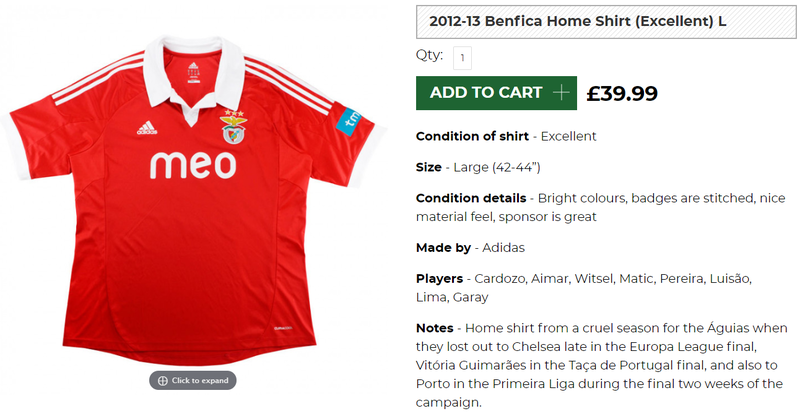 If the above has given you some inspiration to buy a Benfica shirt then why not buy one of theirs from this season. Clicking on the photo will take you to the retailer.